In a world with rising anti-Zionist and anti-Semitic sentiment, some contemporary and others age old, the State of Israel theoretically needs every friend it can get. But that doesn’t mean Israelis should settle for any would-be ally making diplomatic overtures. With regard to the current and copious debate amongst Armenians on the topic of closer bilateral ties with Israel, Israel has abundant reasons for skepticism and concern. In November, Israeli Prime Minister Benjamin Netanyahu and Armenian Foreign Minister Edward Nalbandian met in Jerusalem, marking a rare moment of diplomatic contact for nations with otherwise frosty ties. Following the meeting, Netanyahu declared on Twitter, “We’ll strengthen relations between Israel & Armenia in tech, cyberspace & agriculture.” Nalbandian expressed hope of a “new impetus” for Israel-Armenia ties. Armenian media commentators were quick to capitalize on Nalbandian’s visit by lauding prospects for a nascent friendship between Jerusalem and Yerevan. In truth, however, no such impetus exists. For starters, Armenia is closely aligned with Iran, which repeatedly vows to annihilate Israel (and the U.S.); bankrolls terror groups with that same goal—Hamas, Hezbollah, and Islamic Jihad; and has a mounting military presence near the Israeli-Syrian border. Complicating matters, Armenia is a vassal of Russia, which works with Iran to support Syrian tyrant Bashar al-Assad in that country’s civil war. Perhaps not particularly arguably, Armenia is the least sovereign of the post-Soviet states, filled with Russian military bases and weapons. Russian and Armenian leaders have stated outright that they “coordinate” their foreign policy. Any such coordination means supporting the destabilizing activities of Iran, which seeks to create a Shi’a “land bridge” from Tehran to Beirut, and to seize control of Israel’s northern neighbors. 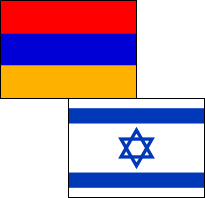 Apart from geopolitics, Israel cannot trust Yerevan, given the deep-seated anti-Semitic views that pervade the Armenian population and leadership. According to the Anti-Defamation League’s most recent index of global attitudes about Jews, a majority of Armenians believe these statements are “probably true:” Jews are more loyal to Israel than to the countries they live in, Jews have too much power in the business world, Jews have too much control over global affairs, Jews have too much control over the global media, and Jews think they are better than other people. How can a Jewish state befriend a country whose citizenry displays such high degrees of textbook Jew-hatred? Warming up to Armenia also runs the risk of alienating Azerbaijan, Israel’s strongest Muslim-majority ally. Azerbaijan, which is in the midst of a decades-long territorial conflict with Armenia, has purchased close to $5 billion in defense equipment from Israel. No similar potential exists for Israel’s commerce with Armenia, which is a poor nation and increasingly so. Plagued by inflation, growing poverty, a scarcity of trade partners, and a severe brain drain, the “start-up nation” of Israel can certainly do better than partnering with Armenia. It is unclear that given the economic and educational differences that a partnership can even exist. Unlike the situation in Armenia, anti-Semitism has not been a problem in Azerbaijan, both historically and presently. While Nalbandian’s visit to Jerusalem was an anomaly, trips by high-level Azerbaijani officials to Israel—and vice versa—are a regularity. During a trip to Azerbaijan in 2016, Netanyahu lauded the country as “an example of what relations can be and should be between Muslims and Jews everywhere.” Why would Israel spoil this fairytale-like relationship for the sake of improved ties with Armenia? Both in narrative and behavior, Armenians bear an eerie resemblance to Palestinians, Israel’s adversary in a seemingly intractable conflict. Armenia occupies Nagorno-Karabakh, which is internationally recognized Azerbaijani territory, and routinely launches attacks on Azerbaijani civilians in violation of the cease-fire along the so-called “line of contact” separating those countries’ armed forces. This should sound familiar to Israelis. As much as Israel reaches out to its adversaries with the hope of attaining an enduring peace, the Palestinians remain intransigent. They do not budge on their demands, make unilateral moves toward statehood, and carry out terror attacks that are fueled by incitement from their leaders. Much like the Israeli-Palestinian conflict over the West Bank is perpetuated by irrational Palestinian behavior, the Armenian-Azerbaijani conflict over Nagorno-Karabakh shows no signs of abating due to Armenia’s aggression. It is not Israel’s job to take sides in the Nagorno-Karabakh conflict. But that has nothing to do with the current reality: The Jewish state has an existing thriving relationship with Azerbaijan, and no similar dynamic with Armenia—nor the justification to pursue it. Instead of courting the Iranian ally of Armenia, Israel is much better served adding to its arsenal of Muslim-majority friends—led by Azerbaijan—through rapprochement with Saudi Arabia, which shares Israel’s grave concerns about the Iranian threat. Israel can also focus on its relationships with Turkey, with whom it reached a normalization agreement in 2016; with Egypt, its neighbor that has the common goal of eradicating terror in the Sinai Peninsula; or with African nations that are well-aligned with Israeli values. But as an emerging world power, Israel can be choosy about its friends. It doesn’t need to settle for Armenia. Jacob Kamaras is an editor for the Jewish News Service, and is noted for his work on the Middle East and American politics. His writing has appeared in FoxNews.com, the Washington Times, Independent Journal Review, The American Spectator, and CNS News.